Cast: Belen Rueda, Fernando Cayo, Roger Princep. Directed by Juan Antonio Bayona. Spanish with English subtitles. Story: Spooky goings-on in an orphanage. The Orphanage is a spooky Spanish tale of a missing boy - it's been done before, but rarely as well as this. They're cheeky swines, these movie men. 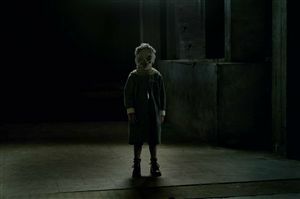 It was Guillermo del Toro's name that made me see The Orphanage - his previous Pan's Labyrinth having caught the Oscar panel's interest a couple of years ago. However del Toro doesn't seem to be involved at all - he merely "presents" the movie, whatever that means, and is one of seven producers. If it had turned out to be a turkey I would've been highly narked, but as it happens this con trick has worked in my favour, because it's a darned good movie. Following very similar tracks as The Dark and The Missing, the orphanage proprietor loses her adopted son amidst supernatural tales of ghostly kids. Is she going loco? Well, I mean more loco, she is a woman after all. Ahem. Fans of chillers will be right at home here - the movie eschews the lazy but popular in-your-face crash-bang approach and creates proper suspense by building up the tension skilfully. I had bare arms when I saw it and the little hairs on them were all struggling to get a look at the screen during the creepy bits. All was going very well until the end, when it all unravelled somewhat. Reading the plot now, I can see how it all fits together and how I could've understood it at the time, but it's presented in a very ambiguous way, leaving you wondering how you're supposed to interpret what you've just seen. A second viewing will help immensely, but I would've preferred a slightly clearer narrative in the first place. The Orphanage is well worth your time, especially if you like your movies on the chilly side. It's expertly played and highly respected - if you like to show that you know about movies then you can't afford to miss it. It's a buff's movie. To enjoy this film you should be: chillable. The Orphanage was released in the UK on 21st March 2008.